Kanazawa Kancho counters roundhouse kick with gyaku oi-zuki (reverse lunge punch) - part of the defence known as 'Mawashi-Geri Number 2' in the jiyu ippon-kumite (free-style one-step sparring) set exercise series of SKI Shotokan karate. SKI AUSTRALIA - scroll to bottom of members page for complete listing of Australian dojos! We're part of SHOTOKAN KARATE INTERNATIONAL AUSTRALIA INC. Australia's largest Shotokan Karate organisation with over 50 registered clubs Australia wide. 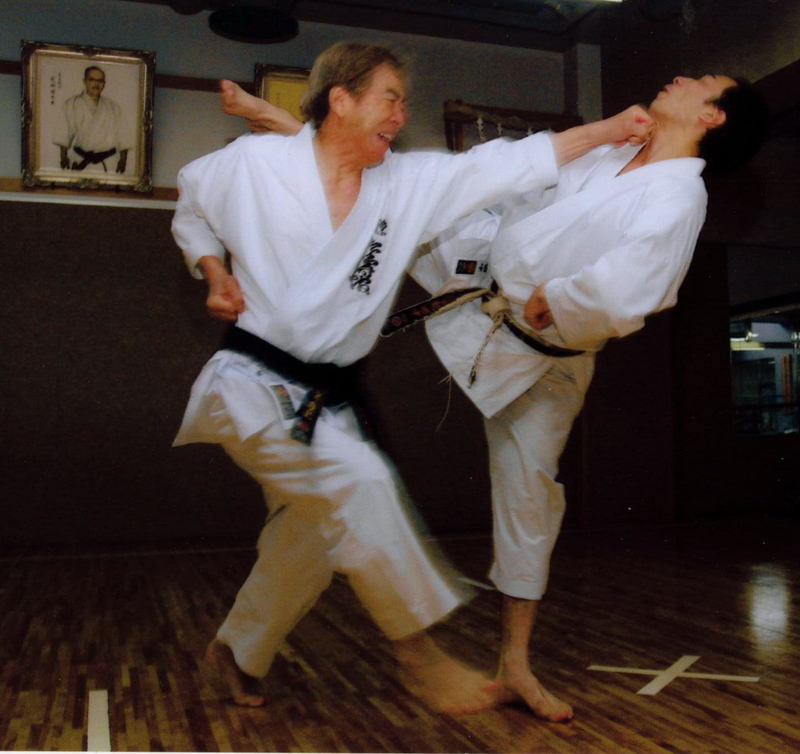 SKIA is directly affiliated with The Shotokan Karate-do International Federation (SKIF) Tokyo JAPAN, headed by Hirokazu Kanazawa Kancho (10th Dan) JKA/SKI - winner of 1st and 2nd Japan Karate Championships in 1957 and 1958. With greater than 2.5 million members and over 100 directly affiliated countries, SKIF is the largest Shotokan karate organization in the world under one instructor! Manabu Murakami Sensei is head of International Section of the SKI Federation. Our Head Instructor, Robert Matthews Sensei, began training Shotokan Karate at age 20 (in 1980) was graded to JKA 1st Dan in 1984, obtained JKA 2nd Dan in 1989 and SKI 3rd Dan (eighteen years latter) in 2007 (after a change of associations). Sensei now has over 28 years of Shotokan Karate experience. Click here to read about what goes on at a "typical" SKIF karate training seminar! Punching, kicking and smashing techniques of SHOTOKAN karate achieve power by concentrating maximum force at moment of impact. Concentration of force depends upon speed of execution, greater speed resulting in increased power. The punch of an advanced karateka can travel at in excess of 13 m/sec generating destructive power equivalent to 680 kgs. While contact must obviously take place when blocking an attack, in traditional, so called "non-contact" karate training, the target for an attack is established slightly in front of the opponent's vital point, including head area, so the target can then be hit with FULL POWER without causing injury. To inflict damage in real self-defence encounters, target is behind the vital point. In Shotokan karate, target is always hit with full power, so the issue is not "what degree of contact is required?" but "where should the target be located?" Location is decided in an instant, the further the target is set behind the vital point, the greater the potential damage, but must of course be in accordance with one's physical strength (capacity to reach target). These days, some styles teach contact with the opponent during training drills. While this is an attempt to maintain realism, it actually prevents participants from developing 'full power' due to fear of injuring their opponent. Some styles may enforce body protection equipment or even ban attacks to the head completely, also compromising development of good technique. If one does not train in attacks to the head area, in "a real situation" where this may prove necessary, one may lack the ability to do so effectively. One should not rely on attacks to other parts of the body always being effective. This may work in the movies but in real life, a guy with strong abs can take quite a pounding to the solar plexus and not be affected. On the other hand, a quick, hard punch to his face, if not knocking him out, may well break his jaw or shatter his cheek bone. Feeling like his head has exploded, he will quickly loose the will to continue his assult. Note: "a real situation" implies your actions are totally justified, not simply the result of impetuous courage. With a "true" Shotokan karate man we find that no matter how provoked he may be, even to the point of physical action, if NOT JUSTIFIED even his strongest, most powerful techniques will not connect. His subconsious mind just will not allow it! To the uninitiated on-looker, this may seem to be as a result of years of in-grained non-contact partner training and a weekness of such systems, "he just can't hit because he doesn't train with contact", once JUSTIFIED however you can rest assured his techniques will connect and are indeed lethal! In the event that you should one day end up in court, needing to prove your actions were indeed self-defence and justifiable, remember one thing, it's better to be judged by 12 than carried by 6. 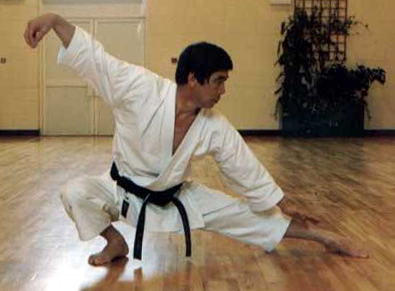 In Shotokan karate, a hard punch and the kind of body conditioning that contact provides, is gained by striking the makiwara using full power of hips. Kicking the heavy bag or strike shields etc, also has great benefits. Such training is not recommended for anyone but adults however as this kind of impact can destroy joints while bones are in growth phase. LUKE BYRNE (JKA/SKC) - Byrne Sensei took up karate as a young lad while living in Mildura. KANAZAWA SENSEI HAS PRACTICED YANG STYLE TAI CHI CHUAN FOR MANY YEARS AND OFTEN TEACHES SEPARATE CLASSES DEDICATED ENTIRELY TO THIS - ALL WELCOME TO JOIN IN. Click for costs, including fees, uniforms, books etc. Click to learn how belt is tied the Kanazawa way.